Find out more about the Lorex 4K Ultra HD IP NVR Security Camera System with pricing, features, and FAQs. The Lorex 4K Ultra HD IP NVR Security Camera System with 8 IP Cameras is a powerful Lorex nocturnal security system. Features include 4K resolution recording, built-in mic, and motorized zoom lens. 2 × 4K bullet and 2 × 4K dome. Pros: Durable camera. Offers comprehensive features like 4K resolution recording and long-range color night vision. Bottomline: High-quality camera with easy to use functions. Created to withstand extreme weather conditions. What are some alternatives to the Lorex 4K Ultra HD IP NVR System with 8 IP Cameras? 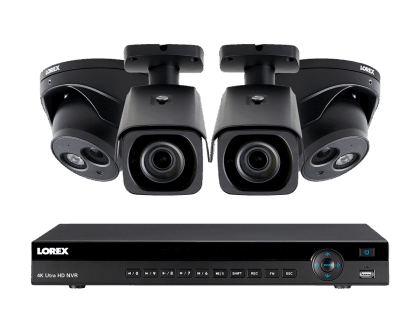 Where can I buy the Lorex 4K Ultra HD IP NVR System with 8 IP cameras? The camera system is available through the Amazon and Lorex website. Does the Lorex 4K Ultra HD IP NVR System with 8 IP Cameras work at night? Yes, it offers a nocturnal system that contains an 8.51 MP image sensor, capable of recording 4K resolution video that captures distinct details. Can the Lorex 4K Ultra HD IP NVR System with 8 IP Cameras be used in any weather? Yes, the Lorex 4K Ultra HD IP NVR camera received an IP67 environmental rating and has been tested in the most frigid conditions including temperatures as low as -22°F / -30°.